Christian Lavey teaches you how to secretly open and close a corked and sealed wine bottle. This allows you to hide various small objects (cards, silks, coins, paper money, predictions, ...) in the empty bottle neck. A wine bottle as 'impossible location' offers a real surprise moment. Depending on the environment you are working in, the presence of a wine bottle could be completely inconspicuous - say in a bar, restaurant or at the dinner table. Have a playing card chosen, lost in the deck and reappear in the factory sealed wine bottle. Or hide a prediction in the bottle and have the bottle opened at the moment you want to reveal the prediction. The possibilities are endless. There is nothing stronger than having a signed card or note appear inside a sealed object, whether it be a can or an even more impossible location such as a sealed bottle. 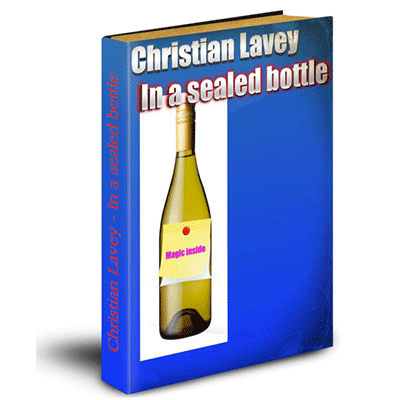 In this e-book you will learn exactly how to uncork a bottle and reseal it! This nine page e-book shows you step by step how to do this, and mentions Christian's idea of using a note inside the bottle. There is a real knack to doing this properly and you will spend some time getting it just right. It is not something you could do during your show, so the preparation needs to be done prior, however this shouldn't stop you from learning this. What is of particular interest to me here in New Zealand, and I know Australia and now Canada use plastic money, is that this lends itself perfectly to having a note appear inside a bottle. You would need to create your own method of having a signed note appear, but it is possible and I think if I were doing a television spot, and really wanted to impress this would be perfect! I would imagine other paper currency may not be as strong because the paper may be too wet, you'd need to try that out. This would work well with a playing card, and if you used a torn corner type idea then the final reveal of a card with a corner missing couldn't be stronger. You will need a few props, one in particular Christian explains you can get cheaply on e-bay. It was actually something I didn't know existed and is what makes this work so well. I have experimented myself over the years with trying to reseal bottles of wine, and never been successful. After trying this method a few times, that's my excuse for having to buy wine, I must say it works really well. It does require some practice and is a bit of a hassle to start with, but once you get the hang of it you will be able to do it pretty easily. If you don't mind doing pre-show preparation you will have a very strong tool here. The card or note, or whatever else you can get inside a bottle, can usually be hidden until needed so the bottle can often be in view prior to the performance. This little e-book will save a lot of people a lot of time in trying to fiddle with this idea, everything is explained with detail and photos.